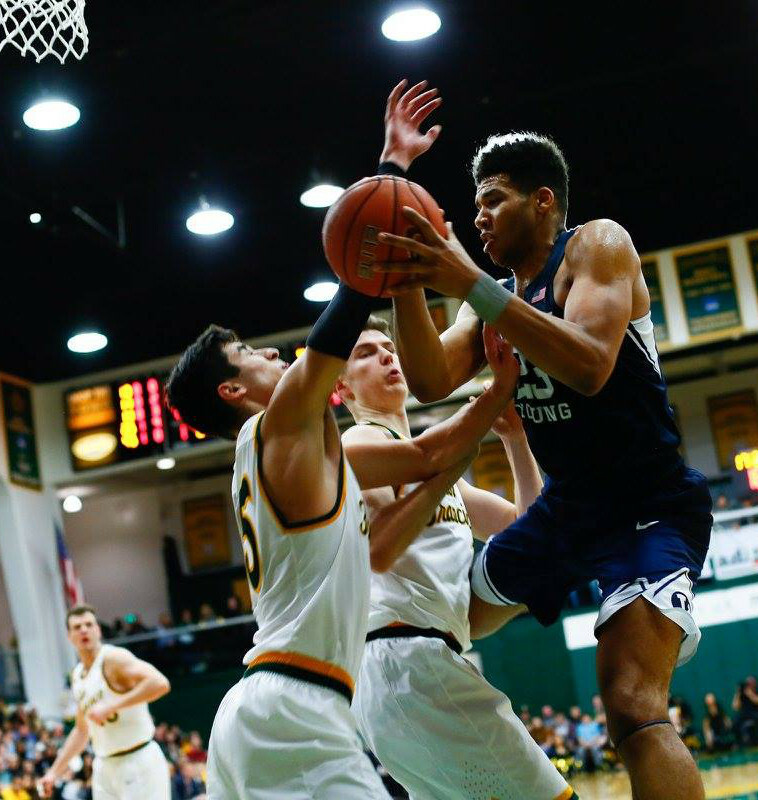 SAN FRANCISCO – BYU took sole possession of third place in the West Coast Conference by beating San Francisco 68-52 Saturday night on the road. For the Cougars (18-9, 9-5 WCC), Yoeli Childs had career highs of 23 points and 17 rebounds, and also three blocks. TJ Haws added 17 points, 5 rebounds and 3 assists. Eric Mika and Elijah Bryant had 12 and 11 points, respectively. BYU, which leads the WCC in blocked shots, had a season-high eight blocks on the night. The Dons fell to 18-9, 8-6 WCC and gave up their share of third place in the conference. BYU extended an early first-half lead to 15-6 when Mika hit a pair of free throws near the 10-minute mark. Not long after, Childs maintained the lead with the Cougars’ fifth block of the night. Childs helped BYU increase its lead to 36-22 at halftime. He scored eight of BYU’s last 13 points of the half and had 13 points, seven rebounds and two blocks in the game’s first 20 minutes. Haws used a pair of 3-pointers and two jumpers inside the arc to score the Cougars’ first 10 points of the second half. With 12:43 left in the game, BYU led 46-28. The Dons worked to cut the deficit to 52-39 with under eight minutes to play. On BYU’s next three possessions, Bryant hit a pair of free throws, Childs had a putback and Bryant made a transition layup as the Cougars extended their lead to 58-39. From there, BYU made several trips to the free-throw line and coasted to a 68-52 win. The Cougars take on San Diego and Saint Mary’s at home next week. Thursday’s game against the Toreros is at 9 p.m. MST and will be on ESPNU, with a radio broadcast on the Cougar IMG Network, KSL (1160 AM/102.7 FM) and BYU Radio (Sirius XM 143). Yoeli Childs registered his fifth double-double of the season with 23 points and 17 rebounds, setting a new career high in points and rebounds. His 17 boards were tied for the second most by a BYU freshman (Mark Handy, 1973). He also added three blocks and passed Russell Larson for second in blocks as a freshman at BYU with 43. Eric Mika scored 12 points to extend his streak to 28 games in double figures. He also blocked two shots in the first half, giving him multiple blocks in 16 games this year and nine of his last 10 games. Mika has at least one block in all but four games this season. TJ Haws reached double-figure scoring for the 20th time this season with 17 points. He hit three triples, giving him at least three treys in a game for the 13th time this season. Haws added five rebounds, three assists and three steals. Elijah Bryant set a career high with two blocks to go along with his 11 points. Dave Rose started a lineup of TJ Haws, Nick Emery, Elijah Bryant, Yoeli Childs and Eric Mika for the second consecutive game. The Cougar defense held the Dons scoreless in the first half for over six minutes during an 11-0 BYU run. San Francisco was 0 for 10 during the stretch. For the game, the Cougars held San Francisco to 24.7 percent shooting, allowing the Dons to make just 18 of 73 shots. BYU put together a block party with eight blocks, a new season high. Three different players registered multiple blocks, including Childs (3), Mika (2) and Bryant (2). Payton Dastrup added one more. Four players scored in double figures. Childs led with 23, Haws had 17, Mika had 12 and Bryant added 11. The Cougars improved to 10-4 when at least four players hit double-digit scoring.